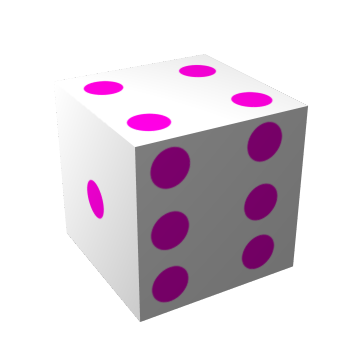 In this tutorial, I will show you how to make 3D dice in GIMP. All material will be made from scratch (of course you can use premade textures if you want) and no extra plugins need to be installed. It’s just a quick tutorial showing you how to do it. So, let’s get started! First, we will need several layers with the images for the die. I am working with images of 350×350 pixels, white background. I quickly created all sides of the die with a simple pink round brush (2. Hardness 100, size 77). If you have all sides ready, we can start creating the 3D image of the die. Go to Filters -> Map -> Map Object. In the General Options, select Box. I checked ‘Transparent background’. 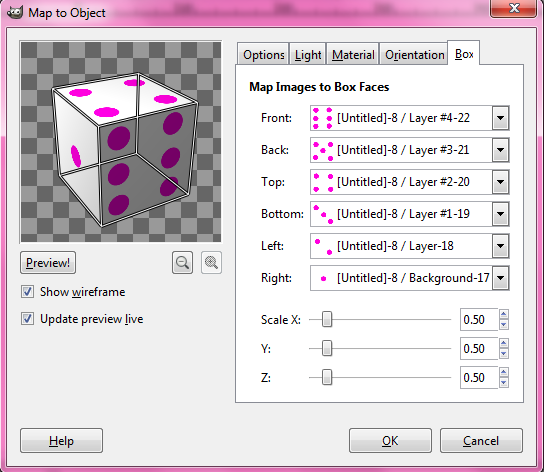 When you are finished, press ‘OK’ to map your layers to your die! Depending on the size of your image, this will just take a sec. And there you go! Your 3D die created with GIMP.